In a miraculous story of pure blind luck, Terry and Donna Claver of Stanford, Montana, recently found the engagement ring that Donna mistakenly dropped inside of their toilet 36 years ago! According to the New York Daily News, Donna had placed the ring on the lid of the toilet and it slipped inside. At that point in their lives, the Clavers were saving money for a new baby, so after removing the toilet and searching through the pipes, they decided it was lost for good. However, during November of this year, the couple was undergoing an extensive bathroom renovation with a new bathtub and bathroom vanity, so the toilet was finally replaced. Terry Claver and his son asked the workers if they could dispose of the toilet themselves and proceeded to take a sledgehammer to the device. Lo and behold, right in the center of the toilet was Donna's wedding ring, which was still in good condition after being trapped there for 36 years. 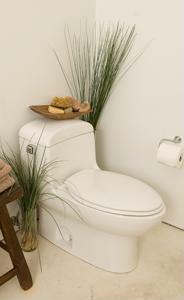 You may never know what you'll find when you begin a bathroom remodeling project. If you found an engagement ring after nearly four decades, would you decide to wear it?